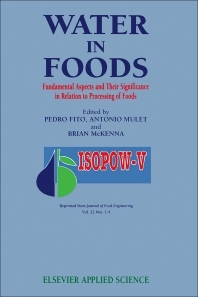 Water in Foods: Fundamental Aspects and their Significance in Relation to Processing of Foods contains the proceedings of the Fifth International Symposium on the Properties of Water in Foods (ISOPOW-V), held in Peniscola, Valencia, Spain, on November 8-14,1992. Organized into 31 chapters, each chapter representing the papers presented in the meeting, this book begins with a review of the theoretical aspects of hydration. Some chapters follow discussing the basic physical chemistry and links between hydration and solute interactions; computer modeling studies of the interaction of water with carbohydrates; and theories of liquid-glass transition. This book also describes the NMR imaging in the study of diffusion of water in foods, mechanical properties of frozen model solutions, and the role of water in biomembrane structures. Other chapters relate water to the methods of food preservation.